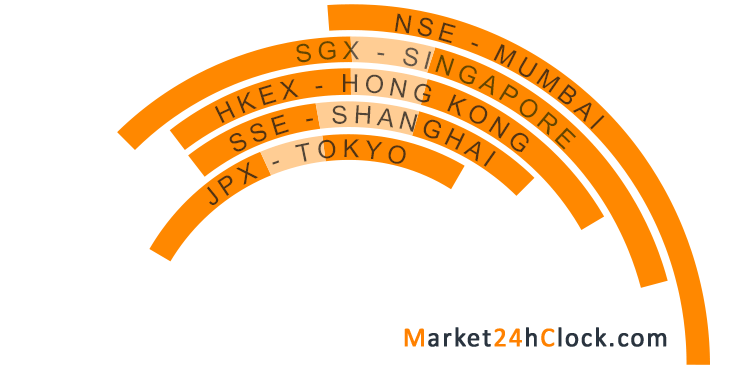 Market 24h Clock shows the Asian session as a block of lighten up in orange color trading hours for following Stock Exchanges - JPX Tokyo, SGX Singapore, SSE Shanghai, HKEX Hong Kong, and NSE Mumbai. The first major Asian market to open is Tokyo. Tokyo has the largest market share, and is the third largest Forex trading centre in the world. Singapore opens in an hour, and then Chinese Markets: Shanghai and Hong Kong open in 30 minutes. With them trading volume increases and a large-scale trade begins in the Asian - Pacific region offering more liquidity for Asian and Pacific currencies and their crosses. Similarly, more liquidity will be offered to the Asian and European crosses when European countries open for business. Risk tolerant (and / or short-term) traders prefer USD/JPY, GBP/JPY, AUD/JPY and EUR/JPY for their broad ranges. Risk averse traders prefer EUR/GBP, AUD/USD or NZD/USD (these pairs are less volatile). In anticipation of the opening of the Europe GBP/JPY, GBP/USD and EUR/GBP considered to be a good choice (highly volatile). Volatility in pips of the major currency pairs during the Asian trading session.